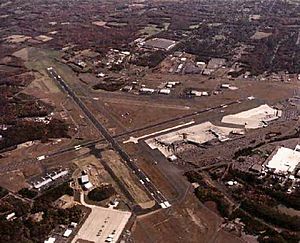 Bradley International Airport is an airport in Windsor Locks, Connecticut serving Hartford, Connecticut and Springfield, Massachusetts. It serves as a hub for UPS Airlines. It hosts an Admirals Club in Terminal A (West Concourse) and an Escape Lounge in the East Concourse. Bradley International Airport Facts for Kids. Kiddle Encyclopedia.